A medieval wedding ceremony can be a romantic and unconventional way to celebrate your union. You can pick and choose which elements to include to create a unique cross between tradition and modernity. Despite cinematic notions of chivalry and romance, in reality, the medieval wedding ceremony was based in practicality. Couples married to cement family ties, acquire property and reproduce heirs. A boy and a girl could be promised to each other at the age of nine or ten and not actually meet until the wedding. However, the medieval wedding ceremony was filled with feasting, dancing and all sorts or entertainment. Even if the bride and groom didn't relish the prospect of marriage, the guests certainly took the opportunity to enjoy themselves! Planning your wedding in a castle is one way to have a medieval wedding ceremony. There are numerous venues, particularly in Ireland, Scotland and England that open their doors to would be couples. However, if whisking away to Kent or Derbyshire does not fit within your budget, there are other ways to give your celebration a medieval flair. In medieval times, brides often wore blue as a symbol of purity and faithfulness. The richer the bride, the more elegant and ornate the fabric. Trimming your wedding dress with a blue border is one way of keeping within the tradition of a medieval wedding ceremony. In fact, the custom of wearing "something blue" is rooted in medieval times, as is the tradition of wearing the garter belt. According to custom, the wedding dress itself could be any color. Rich fabrics, intricate brocades and empire waists are all stylistic elements common to medieval times. Symbolic stones also had a significant place in medieval wedding wear. For example, red jasper was worn for love, beryl for purification and amethyst for piety and martyrdom. During a medieval wedding ceremony, the bride and groom would sit at a raised dais facing the guests with other important members of the bridal party. Having your guests sit banquet style as opposed to rounds can lend a medieval air to your wedding celebration. A jongleur or minstrel was another popular feature of the medieval wedding ceremony. The jongleur would wander through the crowd singing love songs and reciting poems for the enjoyment of the guests. This is one element of a medieval wedding ceremony that could be reasonably adapted to a modern day setting. 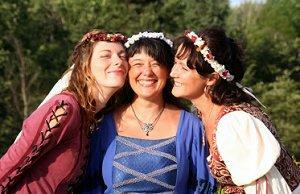 Some elements of the medieval wedding ceremony will be relatively easy for your guests to recognize. More obscure customs, like the wearing of symbolic stones, may require some introduction and explanation. You may want to introduce the medieval wedding theme during the initial planning stages of your wedding. For example, you can style your wedding invitation as a "ban" or traditional wedding announcement common in medieval times. You might also include a small card explaining the traditions that you plan to incorporate, so that your guests will be aware of what's happening.